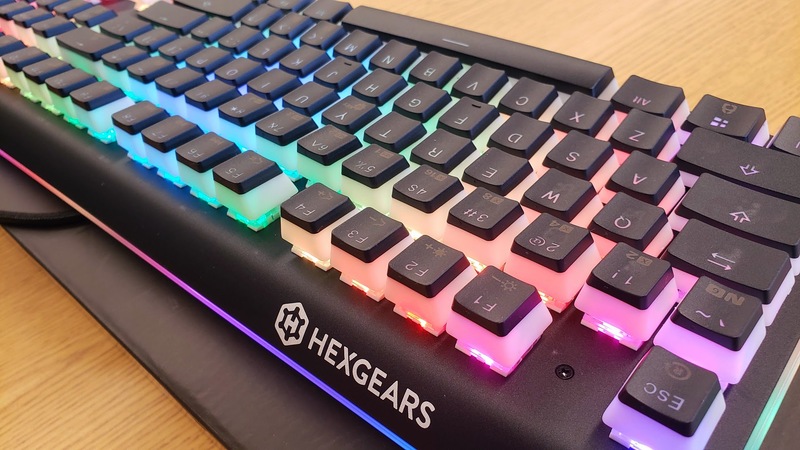 Earlier this week, we took a look at two new keyboards from up-and-coming accessory-maker, Hexgears. Today, we’re looking at another of their premium options with the big and beautiful, Impulse. 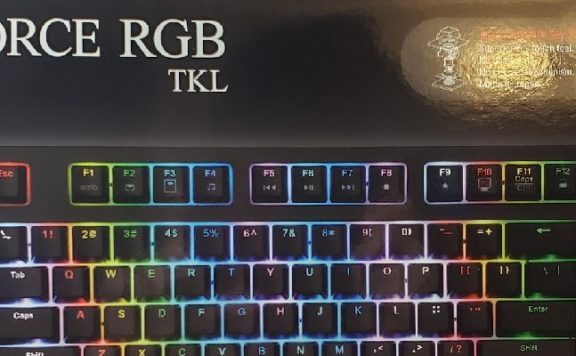 At $89.99 as of this writing, it offers a premium set of features including doubleshot PBT keycaps, software free lighting and macro programming, a vibrant illumination ring, and your choice of Kailh BOX or Hako switches. Compared to the Nova and Supernova keyboards, what we find here has a lot in common while still managing to feel quite unique. Thanks to the inclusion of PBT keycaps, I’m tempted to consider this the “higher end” between the two but I don’t think that’s right. Both lines from Hexgears are high-end in their own way. That said, on the functional of lighting and programming, there’s definitely some similarities, so be sure to read that review if you haven’t. One thing that’s definitely improved with the Impulse is the RGB lighting. You have your choice between two-tone PBT caps and pudding keycaps which are translucent along their bottom half. 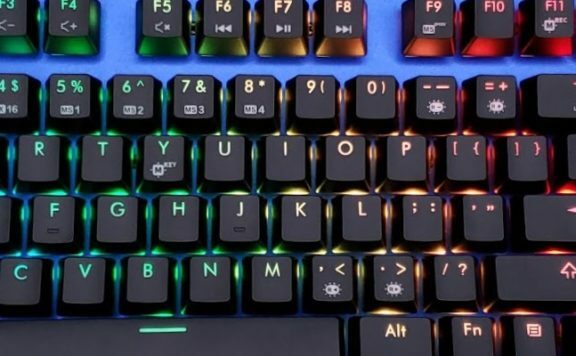 I would definitely recommend you opt for the pudding caps if you like RGB lighting (and you need to enjoy RGB if you’re buying this keyboard). The extra glow provided by the pudding caps is downright luxurious. There’s plentiful preset effects with more than a dozen to choose from and then static lighting and custom layout options on top of that. 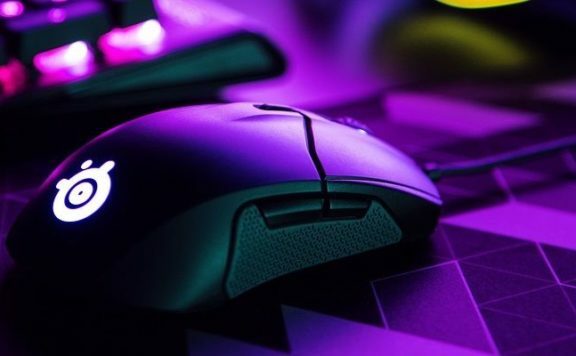 Each can also be customized for color and brightness, which you might actually want to adjust since the lights are definitely brighter than the average gaming keyboard. Another improvement is the light ring that encircles the keyboard. Compared to the Novas, the diffuser is both brighter and wider. This can also be customized through a selection of static colors, a color fade, a static rainbow, and a rainbow cycle. It’s not just the lighting that makes the Impulse look great, though. Hexgears has opted for a curved top plate rather than the hard edges found on most keyboards. The mix of curved edges and rounded corners really lends it a distinctive, modern aesthetic. I also like that they’ve put the logo on the rear curve, so it’s invisible when looking down at the board. I’m not one who minds a bit of branding but lots of gamers do, so it’s a considerate touch. The curve also helps mask the fact that the Impulse uses a plastic bottom shell instead of the full metal design of the Nova and Supernova. If I had my way, I’d stick every keyboard inside a nice metal shell, but the Impulse has found a nice middle ground and still feels great to type on. Having spent time now with four separate Hexgears boards, it’s clear to me that their mission is to deliver premium features at a budget price. The PBT keycaps, for example, are still extremely rare on gaming keyboards but are unequivocally better. 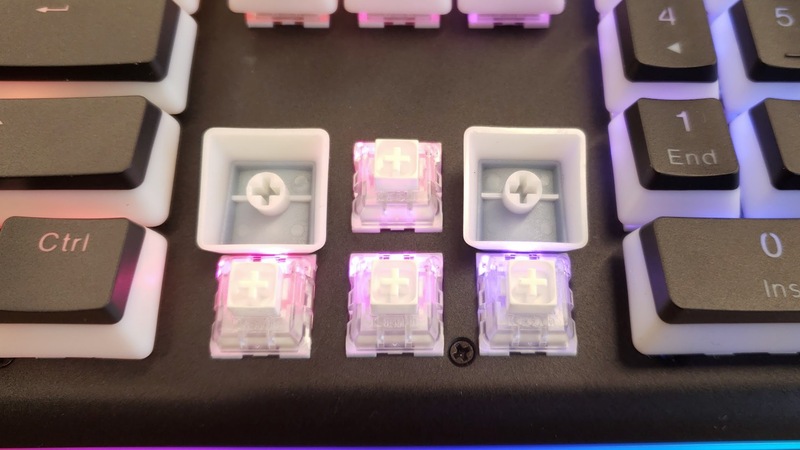 Not only do the puddings look great, but they’re a denser plastic and far more resistant to wear and tear, including the shine that’s all too common on ABS keycaps. That they’re doubleshot also means that the legends will never wear off and fade away. Underneath the caps, you have your choice of Kailh BOX Brown or BOX White switches or Input Club’s Hako Clears. The unit I tested came with BOX Whites. If you’re a fan of clicky switches, these are some of the best you can find without building your own keyboard. Unlike Cherry MX Blues, BOX Whites click on the downstroke and upstroke, which makes them very noisy to use if you’re sharing a room but so satisfying to type on. 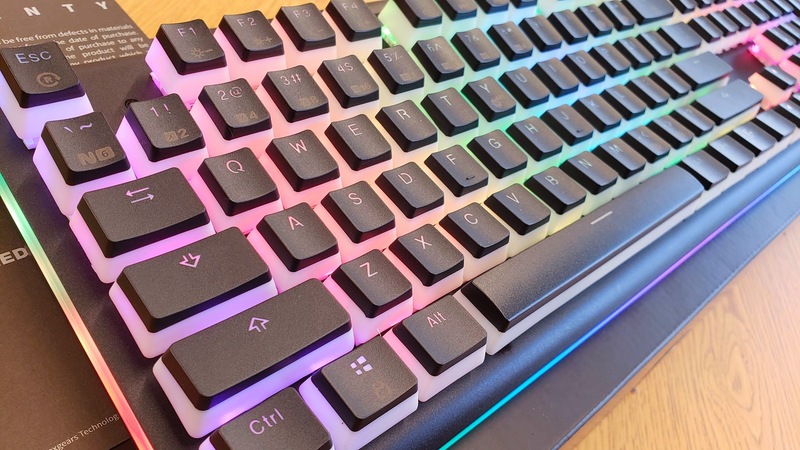 BOX Browns are very similar to Cherry MX Browns and Hako Clears are close to MX Clears with their heavier actuation force and quality tactility. Hexgears is being brought to the U.S. market with the help of Input Club, makers of the excellent Kira and K-Type keyboards. Input Club are keyboard enthusiasts through and through and you can see that kind of attention to detail in many small ways. The stabilizers on the larger keys are well-lubed, for example. It’s not uncommon to see big companies like Razer completely ignore this but it leads to less rattle and an overall much nicer typing experience. There’s also no reverb or spring noise to be found. 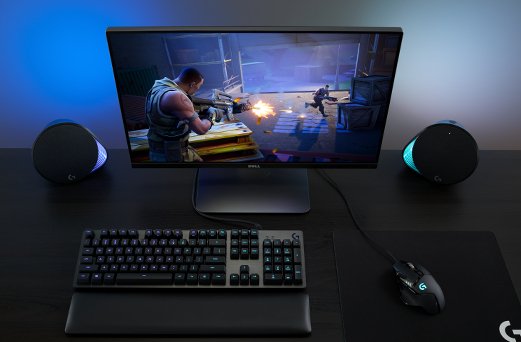 Typing and gaming on the Impulse feels solid and defined. Like the Nova and Supernova, the Impulse offers full macro programmability for up to 16 commands. For most games, this is going to be more than enough, and we also see the return of customizable delays to really tune your string, but if you’re using macros for Excel or web forms you might find yourself coming up a little short. I’d also have liked to see more than five buttons (Y, U, I, O, P) mappable, or some support for multiple profiles, but most users should find this sufficient. Also returning from the Novas is the ability to customize your repeat rate. When you hold a button, like when navigating the map in an RTS, the rate your keyboard sends repeated inputs can directly impact your navigation speed. The Impulse allows you to multiply this speed up to x16, which is incredibly fast. This is also useful for quickly navigating web pages or spreadsheets, though I found x2 and x4 to be just about sufficient for normal use. Just like the Nova and Supernova, the Impulse is another high value keyboard from Hexgears. Since it offers similar functionality, much of the decision between these boards is going to come down to individual features like RGB lighting or whether you care about a full metal case. One thing is for sure, though: these keyboards prove that you don’t have to spend premium dollars to get a premium keyboard. 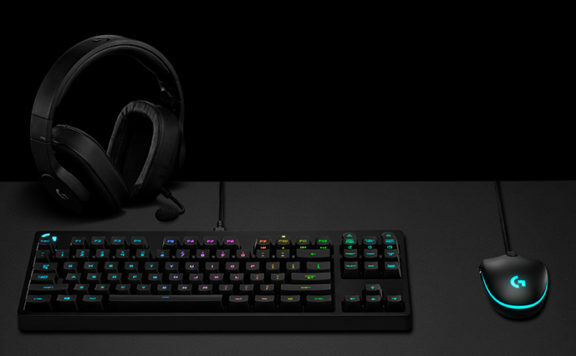 The Impulse is not only gorgeous but stands up against keyboards twice its price, even offering extra features like PBT keycaps and spill resistance. 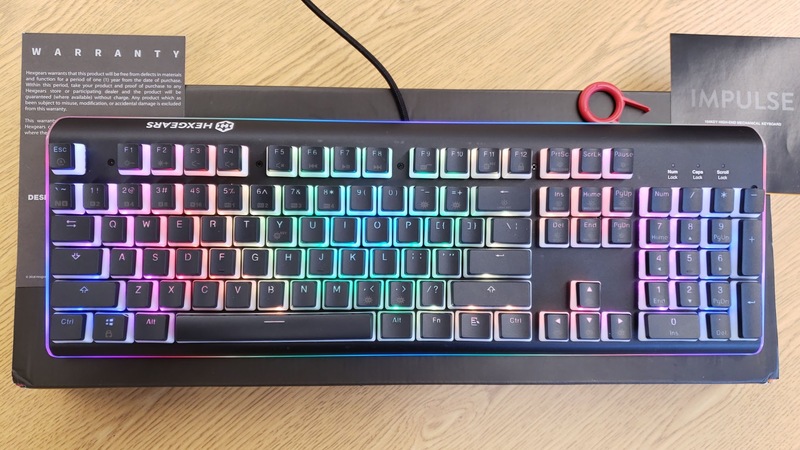 If you’re shopping for a new keyboard, this is absolutely one to consider. The Hexgears Impulse is a great keyboard at an even better price. Like the Nova series, it offers premium features at a very affordable price.